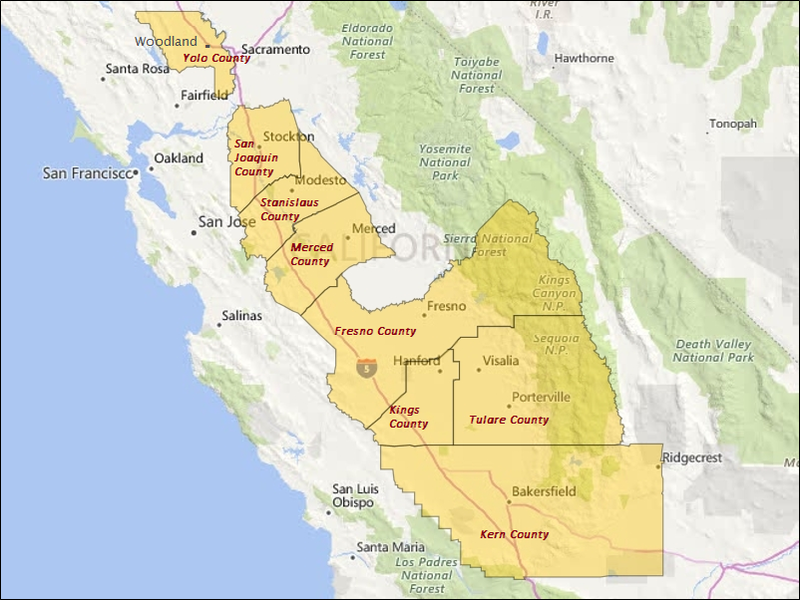 This blog installment provides a comparative analysis of eight strongly agricultural communities in California's Central Valley. The purpose has been to assess successes and challenges - from the perspectives of community and economic vitality. There are differences. What can we learn from their experiences? Central Valley cities range in population from 55,000 (Hanford) to over ½ million (Fresno). County-wide populations go from 150,000 (Kings County) to nearly 1 million (Kern County). Note: Population and other data sets are as of 2017. Across all 8 cities, about 40-55% of the population is Hispanic/Latino. Latino incomes equate to 84% of the incomes for all households in these communities. As of 2017, median household incomes of these Central Valley communities ranged from less than $43,000 per year (in Fresno) to over $59,000 (Bakersfield). By comparison, the median household income for the entire state of California wassubstantially higher at over $66,000 per year. Depending on the community, 43-62% of households own their own home. The highest reported home values are in Bakersfield, the lowest in Merced. For this analysis, communities were classified as high performing if they met 8 or more of the 11 factors considered. Other communities are noted as mid-tier and lower performing. Bakersfield – above average on 10 of 11 factors – all but Hispanic incomes relative to incomes for all households. Visalia – scored above average on 9 factors – all but median age and home valuation. Woodland – above average on 8 factors – all but city growth rate, median age of residents, and proportion of Latino adults with a bachelor’s degree or better. Fresno – as the largest city in the San Joaquin Valley scored above average on only 4 of 11 factors – young median age, proportions of total and Latino population with bachelor’s degree or better, and % of workers with white collar jobs. Stockton – scoring lowest with only 2 factors indicated as above average – county-wide population growth rate and Hispanic incomes as a % of all household median income. Modesto – noted as above average for 6 of 11 factors – Latino college graduation rates and incomes as a % of all household median income, low proportion of households below poverty level, white collar jobs, proportion of homes owner occupied and with higher home values. Merced – above average on four factors – city and county population growth rates, low median age of residents, and Hispanic incomes as a % of all household median income. Hanford – above average on 5 factors – city population growth, low median age, Latino bachelor’s degrees or better, median household income, and owner-occupied housing. As the largest and third largest cities in the Central Valley, respectively, Fresno and Stockton demonstrate that historically agricultural cities do not necessarily grow their way into greater economic vitality and opportunity. While relatively large, both communities have experienced sub-par population growth since 2000, have relatively low median household incomes, high proportions of families below poverty level, low homeownership rates and home values. A more detailed assessment was made for the three high performing communities of Bakersfield, Visalia and Woodland -- involving qualitative as well as quantitative factors. So, what findings can be drawn from a review of the three high performers? 1. Cities that have prospered economically have done so by extending from and diversifying beyond their initial agriculture strengths – albeit in varied ways. Bakersfield has diversified by taking advantage of opportunities in energy production, diversified manufacturing, federal installations, construction jobs and proximity to the Los Angeles market. While more isolated, Visalia has become the retail, business service and governmental center for the vast agricultural region of Tulare County as well as for non-ag basic industrial firms. In contrast, Woodland has diversified beyond agriculture by taking advantage of proximity to two major interstates (I-5/I-80), the state capitol (Sacramento) and university (UC-Davis). 2. Where available, economically successful communities have taken advantage of their proximity to larger urban centers and/or regional transportation networks. Of the three case study cities, this is particularly the case for Bakersfield and Woodland – facilitating their rise as major distribution centers serving the LA, San Francisco, Central Valley and broader west coast markets. These two cities also are proximate to the two major airports of the Central Valley and are receiving spillover residential growth from nearby major metro markets. As a community more removed from major metro areas, Visalia focuses on internal connections to maintain a role as central hub within its vast agricultural hinterland. 3. Effective, adaptive local governance, infrastructure and cultural amenities should be considered as elements integral to community and economic vitality. All three of the profiled cities have active heritage programs and a local arts/cultural scene with a downtown area focus. Two have minor league baseball teams. Visalia is transitioning from at-large to district-based City Council positions. To more proactively address statewide drought issues, the Water Association of Kern County is embarking on a public-private partnership effort to educate the general public – including extensive use of social media. 4. Improving adult educational attainment in these traditionally ag-based communities represents a continuing challenge, particularly for the local Hispanic population. Latino education levels continue to lag well behind attainment for the full population of all the California Central Valley comparables considered. This suggests that education alone is not necessarily the best or only community development strategy. Rather, the critical need appears to be to better tie education services from K-12 to college to real-time job opportunities and needs of the local community. 5. Similarly, narrowing the income gap between the Anglo and Latino population comes across as a factor relevant to continued economic momentum and prosperity. For the California high achievers, the common thread appears to be white collar jobs – offering higher pay and opportunities for career advancement.